Time to trick my kids! They are asking for McD almost every day and it's time to stop! 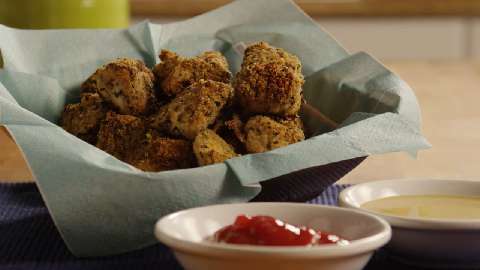 Here is a BETTER and MUCH healthier alternative to those nuggets and they are a LOT tastier, too. 1. Preheat oven to 425 degrees F (220 degrees C). Spray a baking sheet with non-stick cooking spray. 2. Cut chicken and 1-inch cubes. 3. In a bowl, beat the eggs with the water and add the chicken. 4. Combine the parsley, thyme, bread crumbs, flax seed, basil and pepper. Stir in the oil with a fork and mix well to distribute evenly. 5. Pour seasoning mixture into a resealable plastic bag and toss the chicken pieces to coat. 6. Place coated chicken pieces on the prepared baking sheet and bake at 425 degrees F (220 degrees C) for 10 minutes, turn the pieces, and bake for an additional 5 minutes.